Do writers need business cards? Do writers need business cards? I’ve found them to be a great way to connect with others, especially potential readers. Using business cards is certainly more professional than scribbling my name, book title, and email address on a piece of paper. Even in today’s digital world, having a paper card has come in handy, especially to spark conversations. 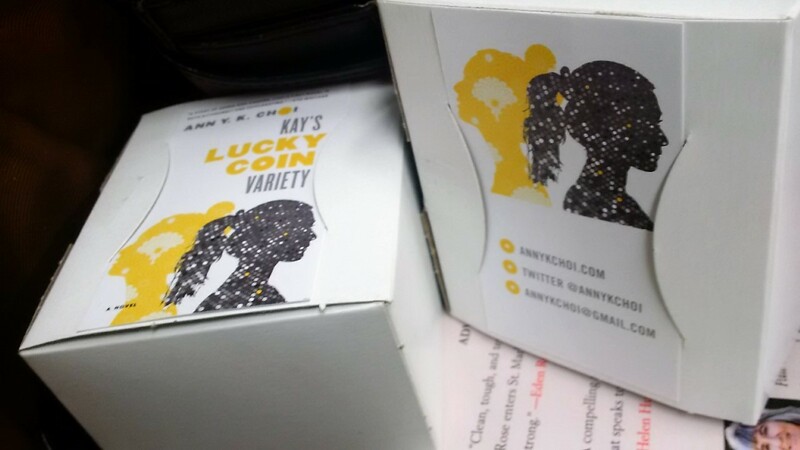 My card has the cover design of my novel, Kay’s Lucky Coin Variety on one side (a quick way to market the novel!) and my contact/social media info on the other. I can’t take any credit for it – my publisher created the design and provided me with a box full of cards. Some author business cards I’ve seen included QR codes. Others had colour photos of the authors. A quick search online showed conflicting views on what should or should not be on a card. Some sites recommended including a short bio or book blurbs, while others stated that doing so would make a writer seem unprofessional. One thing everyone seems to agree on though is that business cards continue to be a valuable marketing tool. I’ve exchanged or given out cards at book signings and readings, author visits to schools, conferences, and at any social event where I’m meeting others for the first time. They’re also great to have when I run into old friends or people who express an interest in getting to know me and my work better. I’m sincere when I tell people I’d love for them to drop me an email and say hello. PrimeTime: What Kind of Business Cards Should Writers Have? Writers – What Should Your Business Card Say?